18 months after I moved into this house, Divine grace and magic continue to take place. I continue to swim with dolphins on mornings that I have time. Even though some mornings I go out to the bay late, i.e. 10am the dolphins are still there for me. More and more people find me on the internet asking for energy work, for which I am very grateful. My heart is filled with joy everything time a client tells me that they feel and live better. This is me taking a selfie in the water five days ago. I instinctively put my hands out to Reiki them. Mom cautiously stayed with me. We three swam side by side for a minute, being with dolphin is like being in a time warp, could be much longer or shorter. When mom decided to swim away, I said, come back if you want more. Next time I looked down, they were near me again. I did more healing while we enjoyed each other's eye contact, only to be broken off by a young woman dashing towards them. They sped off. I told the young woman and her friends how to be with dolphins. She regretted her behavior and accepted my message very well. Next time, I looked around me, the same mom and calf were back. Each time she was a little closer to me. And of course her child was tugged under her all the time. I added Ho'oponopono while sending them Reiki. We swam for what had seemed a very long time side by side:) When they left, I went to look for other members of the small pod and watch them playing or resting. My attention in the water was broken by water splashing. I looked up and it was the calf jumping and spinning. I acknowledged by, "I see you, baby!" Before long, mom and baby was near me for more Reiki and Ho'oponopono. These were Divine moments that I treasure. Being accepted and able to give back to my beloved Pod. Pasha, New Thought's president called me in early June to ask if I will be speaker at one the services. I was honored to receive a phone call from Pasha and since my passion in life is to make people happy, I quickly said yes. The subject of the talk is "my path to spirituality". I did fine talking about Donna Eden inspiring me to move my mother out of the best nursing home in Hong Kong to her "hometown" in Shiu Hing, Quang Dong Providence of China. It was a very long story that I had to shorten to 15 minutes. It was well received. I was also allowed to offer a workshop in the afternoon. I put up a flyer "Self Empowerment with Energy Medicine" which is an introduction to my beloved mentor, Donna Eden's Energy Medicine. I only had 3 pre-register by the night before the workshop, but I printed 12 handouts. The next day, exactly 12 came :) The Divine's answer to my wishes. All attended were attentive and asked good questions. I think Donna will be proud of me. I don't like to sit inside a car but I drove to Hilo and back yesterday (6 hour to get in a helicopter to see the lava. I had no expectation how I would feel. WhenI saw the "red road", I felt an overwhelming sadness. The red road looked like veins filled with Mother Earth's blood, through Fissure #8, Mother Earth spewed her guts to show us that she's hurt, telling us that changes are urgently needed. I did not think about the houses, the warm ponds and the reef. Homeowners, please don't throw any stones yet. All the destruction is part of the change needed. Pele's current activity is not directing at you, your property. Or, is she? I felt that she just want us to know that way too much harm to her had gone unnoticed. Fracking being the 1st. I am calling my earth siblings...! Please start paying attention to our planet which is our home. Aloha, Namaste. During last week's coaching on the phone, my client was very agitated and frustrated with her recently separated husband. He had filed for divorce asking for full custody of their 18 months old son amongst other unreasonable demands. At the end of our conversation, I said to her, I understand that you're going through a very difficult time, but please remember, all this will past. So, every time you feel angry and frustrated, put your arms crossed in front of you, take a deep breath, and say out load, "All this will past." You will start to feel better. I had a two-hour swim this morning because the dolphins kept going farther and farther north, away from my entry spot which is the rock beach of Kealakekua Bay. After about one hour, I know it will take me a long time to swim back because I'm slow and the current sometimes keep me in a circle:). I said goodbye to my beloved, and ask, will you come by to say goodbye? I started swimming without looking ahead. When I stop to see if I am still heading the right direction, the pod had come all the way back. They were jumping ahead of me on the way back to my landing spot. How sweet they are. I swam towards them and had more time to enjoy their presence (Yes, they have many times, swim right next to me and we looked at each other's eye within 2 feet) plus close up views of their beauty. Aloha, love and light to you, the reader and the dolphins. I have a stack of plastic boxes to hold my clothes in my bedroom where there used to be a solid Cherry dresser. Yet, I AM ecstatic. I am filled with joy everyday. I wake up and walk out soon to Kealakekua Bay to see if the Spinner dolphins came in to rest or play. Sometimes, I run home to put on my swim gears and go out, other times I just stay and watch them. I am incredibly energized just to see their graceful movement. Other days, I swim and be thrilled to see turtles which was close to extinction recently. My beloved Spinner dolphins gave me the most incredible present I could not have imagined. I was the only swimmer in Kealakekua Bay at 9.45am this morning. I saw only a few dolphins surfaced and I went in. Yes, I will only get in cold water that early when dolphins are there. I swam out to the driftwood, the place where current is strong and I take a break there. I saw no dolphin, no one, not even a kayak. The only boat is far far away. I said, "Where are you? Will you please come closer? I'd love to see you. Pretty please." Within the next two seconds, a pod of dolphins is within 50 feet ahead, swimming straight at me. I look down and they have already arrived next to me. They were swimming so slowly. I got to spend a long time next to them since I don't swim fast at all. Then a woman came out floating on a noodle, we talked and I taught her the proper etiquette of swimming with and taking pictures of dolphins. While doing that, I looked down and saw the largest "fish ball" I've seen to-date. It could have been 100 feet long and 20 feet wide. Thousands of fish, 6 to 8 inches long were packing themselves in there. There are some swimming loosely above. I'm surprised I did not see any predator near by. I started to feel chill and need to head back to shore. I thank the dolphins and said, "I need to go back, be nice if you come by to say goodbye." I started swimming hard back to shore and next time I look, there were dolphins all around me :) !! My beloved are so good at telepathy. They constantly amaze me. I say now, my dear Pod, I love you. Happy Valentines day and a good night of feeding out there! This morning, 3 days after the virus invaded my body, I declared that I had successfully eliminated them. I had hired others to prepare the Ohana (guest house) so that it would be ready before December 26. But December 26 came and there is still some finishing touches to do. I hung pictures, put out decorations, move unnecessary items out to storage, swept the front entrance...etc. Then I cleaned the bathroom. I was sitting on the bathtub to clean and somehow, I fell off. No problem, my behind hit the floor, BUT, next, my upper body went back and the back of my head hit the floor which is cement under the linoleum. Ouch!! that hurts a lot. I sat up leaning up again the wall to regain equilibrium while I "figure 8" the hurt spot. After I got up, I managed to go upstairs and put "Deep Blue"- blend of essential oil on the now egg-size bump on the back of my head. I Reiki while I hold the 128 Hz tuning fork on the sore spot. That was about 12 hours ago. I live to tell the story. All the modalities I used must be good. I was in Kealakekua Bay yesterday on a kayak for the first time with new friends. We paddled towards the Captain Cook monument where I snorkeled and swam. The water is the clearest I've seen in the world. I got in the water many times then of course that means I had to climbed back into the kayak just as many times. During one of those climbs, I pushed on a bottom left rib a hair too hard. I was sore but that did not dampen my spirit. I knew I could use ENERGY MEDICINE and essential oil and tuning forks to re-balance it. On our way back to the landing, alas! the Spinner dolphins showed up to see us . Dozens of dolphins of all ages, some jumped and many surfaced around us. I was overjoyed. The only kill joy was one tour boat (there were about 4 motor boats carrying tourists) went straight at the pod while they were on the surface. Oh, dear (: I thought the boat captains should have all been properly educated to steer and leave enough distance between the boat and the dolphins. If you're out there with your boat, remember stay 50 yards away, please. I went to "Two Steps" favorite swim spot of the locals and visitors on Big Island., at about 11am with new friend, Michael Hyson, esteemed Dolphin Researcher. According to most, late for dolphin sighting at the bays. Alas! the dolphins were still there. Whoopie! My first time seeing them at Two Steps. Last time I swam with dolphins at Kealakekua Bay , I thought "life can't get better than this". Yes, life gets better and miracles happen every moment. Believe! When I saw the first jump, I thought, "there goes a flying fish". But it was a baby dolphin. I have never seen such a small dolphin jump and spin. WOW. I ask all of you to tell your friends and children, grandchildren to please swim SLOWLY towards them if you're blessed to have the opportunity to be in the water with wild dolphins. I see uninformed people dash towards dolphins extending cameras on 2ft. long sticks. That is NOT polite amongst human nor dolphins. I gently explained it to the intruder and he took it nicely. Thanks to all of you who listen, please educate humans you know, how to behave amongst my people (dolphins). I hope you will be blessed with time in the dolphins living room (ocean). Pictures taken by others. downloaded. I met the owner of the house I'm buying next week. We had a very pleasant time during which he told me the history of building of the house. He told me he is relieved to have met me because his wife and himself were worried about who's getting the house, would they love living there as much...and so on. I was surprised to see once more how people are emotional about their material belongings. Yes, a house triggers our feelings since so many memories of loved ones were created in it. But in the end, it is a possession that has no feelings. At 82 years of age, with a world of life experiences, he has not learned to let go. Ah, its all a part of our life journey to learn and become enlighten. Divine time with dolphins this morning. My second swim at Kealakekua Bay with wild Spinner dolphins. After waking up at 6.30a I immediately got out of bed and took care of the cats inside and outside:) I went in the water a little after 8am. Took me a while to swim to the gathering spot where there was a kayak and about ten swimmers. Since I don't swim efficiently with fins and mask, I was slow but I patiently waited around and swam towards the direction they were heading. A small pod of five or six came towards me. This first pass they were all around me. One was carrying a leaf on her pectoral fin. Another one stay with me a little while. When she left she blew me a bubble :) Thank you, sweetheart. My heart was over filled with joy and love. The next time around, two of them stayed with me for a long time. They swam at my pace right by my side. We had nice long eye contact and love exchange. This is THE life we all are supposed to live!! Begin everyday with joy and love. Pictures were taken by other friends. Organizing the move from Hilton Head to Hawaii started at the end of March when I returned from Captain Cook, Hawaii. After four months of continual planning, phone calls, travel arrangements, disposing of personal items, packing, shipping and selling of properties, my energies are at an all time low. However, my spirits are flying high above the atmosphere. 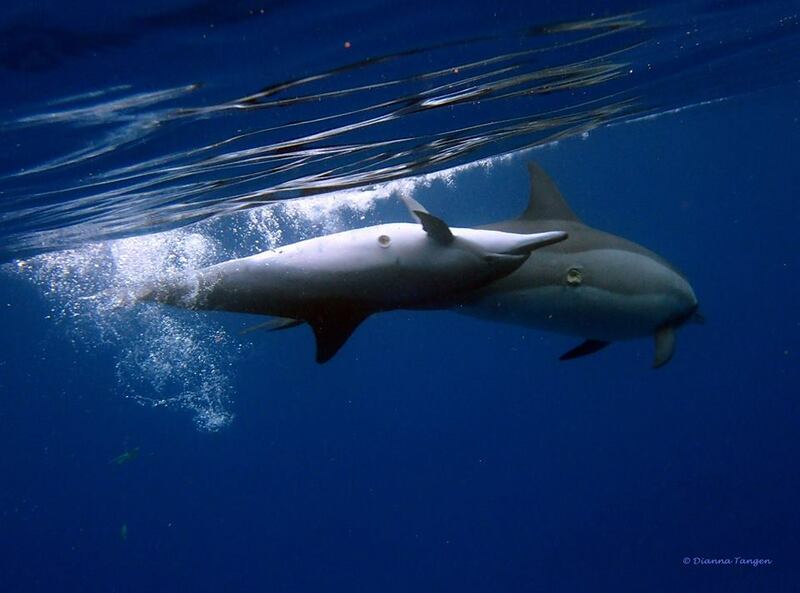 The vision of swimming with Spinner dolphins in the crystalline blue water of Hawaii and a new healing studio steps from my home, keep me smiling and working at the chores on hand. I learned many important lessons along the way. I am grateful to the Divine's guidance. I arrived in Kailua-Kona on August 17 as planned. Om, my boycat was quickly approved after inspection at the airport, to be released. Ah, all my angels and guides are constantly taking care of me. My new friend, Terra, was there waiting for me with lei and open arms. Life is so wonderful here in Hawaii. I am continuously amazed by the kindness and friendliness of the locals. Drivers stop to allow me to cross the road. Yesterday, I was walking home with groceries and decided to put out my thumb. First driver went right by. I thought, ah, a tourist. The second driver, stopped to tell me, "sorry, I am only moving my car to the next parking lot." Ah, a local. So thoughtful are the people who live here. That is exactly what I felt when I visited in March and one of the many reasons why I made a very quick decision to move here to The Big Island. Now, I am living a dream. So far so good. The waves are much bigger so I did not go out with my boogie board as I did yesterday. I slept late. Soon after I got up, I took all the furniture and plants from the balcony indoor. Those required quite a bit of cleaning. After that, I shot a video and posted it on youTube. It took an hour to upload. I made a delicious lunch of wonton added to Pho, and settled back in the recliner to connect with everyone who has evacuated on facebook. As of now, 8:05pm, the wind has picked up speed and its raining much harder at different times. I am glad I am indoor and I cannot hear the wind outside. The new windows we bought in 2004 is worth every penny we paid. On Tuesday, October 4, I heard that South Carolina's Governor had ordered Mandatory Evacuation from my home Hilton Head Island and all coastal areas. Reason number one: Taking orders is the least of my skills. I had just come home from Atalla, Alabama going through Atlanta with construction traffic, which made the six and a half hour trip into nine and a half hours. My body is still aching. I told Om, my boycat, who was SO good in the car during the long ride, that we will stay home for the rest of the year. I must keep my words. Animal lovers out there, pay note. Your animals listen to what you say. I am not just being stubborn. I used my left brain and analyzed the situation. I spent my first eighteen and a half years on Hong Kong Island. We had typhoons every year. Sometimes several strong ones a year. My family and I lived. Now, I live in a building that is built of concrete and steel. In 2004, when I made Hilton Head my year round residence, I got on the board. Me the the other two board members voted to replace our windows, doors and roof. All items were made to the latest storm code. AND, considering history, ever since NOAA had been tracking hurricane, none had directly hit Hilton Head. Yes, there was a hurricane hit over a hundred and ten years ago. Compare that to ten or sixteen hours of mingling with all evacuation traffic on all highways going west, absorbing panicking energies along the way, getting somewhere, not knowing where, sleeping in a strange environment, its much better for me-who is so energy sensitive, to stay home, and go with the FLOW. I love to witness the force and beauty of nature. A couple of extra bonus points: the current temperature is between 75 and 80 degrees, if the power was to go out, I will be comfortable. Point No. 2, I haven't watch baseball in years, I can entertain my self watching the play off, if I was to get bored being indoor. I was at the airport, leaving San Jose, Costa Rica to come home after 3 weeks in Panama and Costa Rica, I sat next to a woman who had her lips curled downwards, and face that looked like a frown. I said quietly to her, "I like your glasses." That brought a smile to her face. I am glad! If we could all notice the people around us and contribute so little to lift their spirits. When I ask my clients, "Have you done your daily energy routine?" I hear frequently, "i just don't have the time." I am going to give you one tip to "make" more time. I started practicing it several weeks ago. Let me know how it works for you. Pick out an outfit, change the top, but wear the same pants or skirt for a week, then wash it. Nobody will remember that you wear the same pants you had on the day before, and even if they do, why does it matter to you what they think? This method saves you time of doing multiple loads of laundry, i.e. if you separate your laundry into white, medium and dark colors. Considering if you had chosen tops that are in the same color group as the pants or skirt, it will all be done in just one load. Alice Tobin is an Eden Energy Medicine Certified Practitioner and Teacher in Hilton Head Island, SC. She leads workshops and offers individual sessions on easy-to-learn techniques that relieve pain, sharpen your memory, increase your stamina, strengthen your immune system, manage your weight, repair your thyroid, reduce stress, manage hot flashes, and increase your joy, contentment and emotional well being. Energy Medicine is both a complement to other medicines and a complete self-help, self-care system.